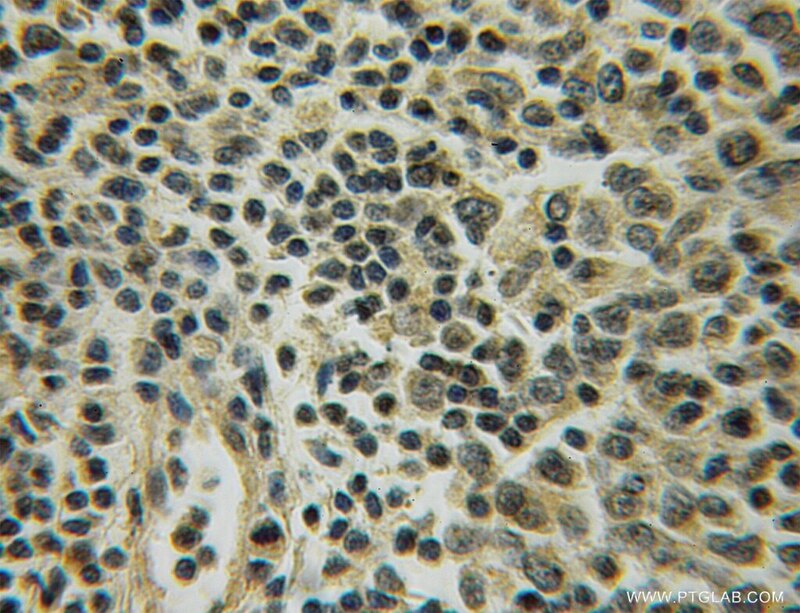 IP Result of anti-UGCG (IP:12869-1-AP, 4ug; Detection:12869-1-AP 1:500) with A375 cells lysate 3200ug. 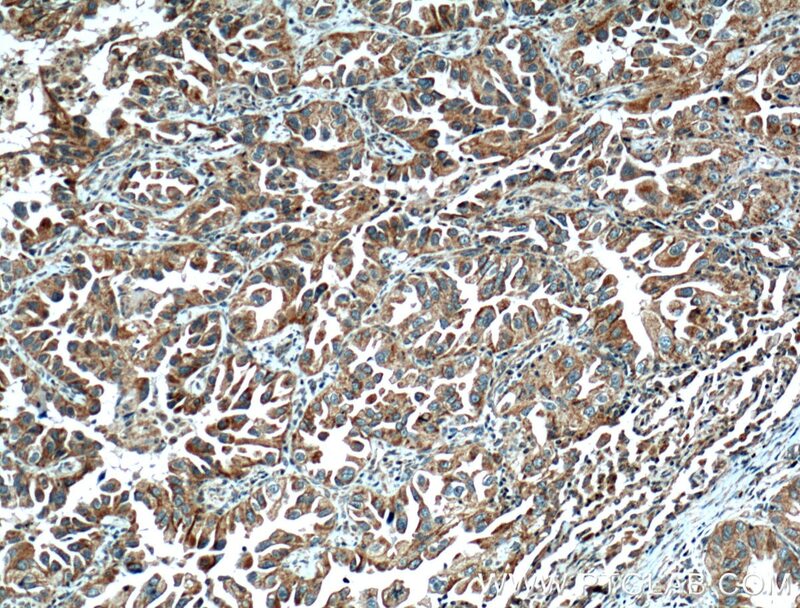 Immunohistochemical analysis of paraffin-embedded human lung cancer tissue slide using 12869-1-AP( UGCG Antibody) at dilution of 1:200 (under 10x lens). heat mediated antigen retrieved with Tris-EDTA buffer(pH9). 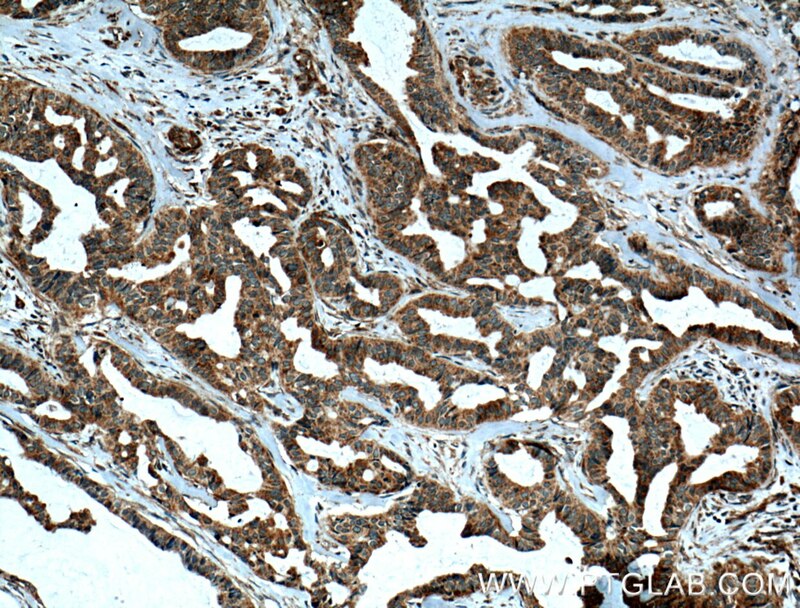 Immunohistochemical analysis of paraffin-embedded human lung cancer tissue slide using 12869-1-AP( UGCG Antibody) at dilution of 1:200 (under 40x lens). heat mediated antigen retrieved with Tris-EDTA buffer(pH9). 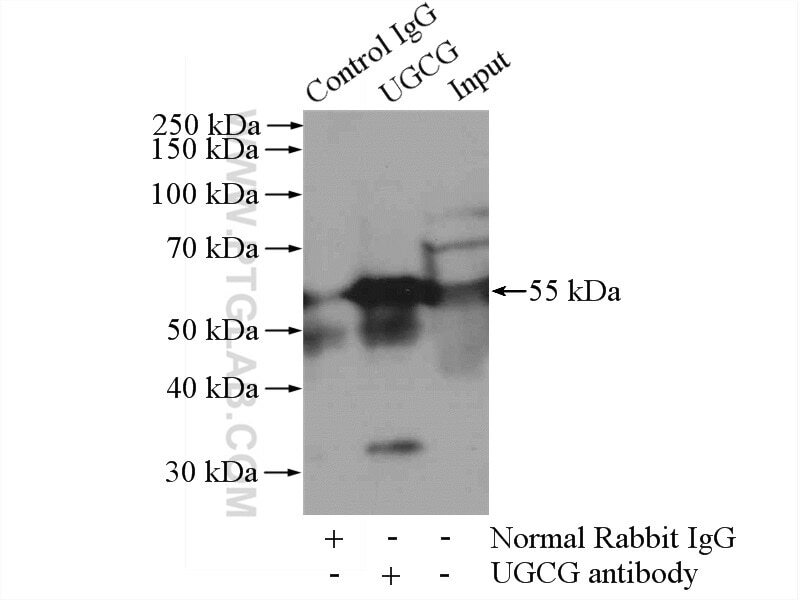 UGCG, also named as GCS and GLCT-1, belongs to the glycosyltransferase 2 family. It catalyzes the first glycosylation step in glycosphingolipid biosynthesis, the transfer of glucose to ceramide. UGCG may also serve as a "flippase". It is up-regulated at the transcriptional level during keratinocyte differentiation. UGCG is a membrane protein. The calculated MW is 45kd. In SDS-PAGE, it is about 50-55kd. Aneuploid cell survival relies upon sphingolipid homeostasis. Amyotrophic lateral sclerosis and denervation alter sphingolipids and up-regulate glucosylceramide synthase. 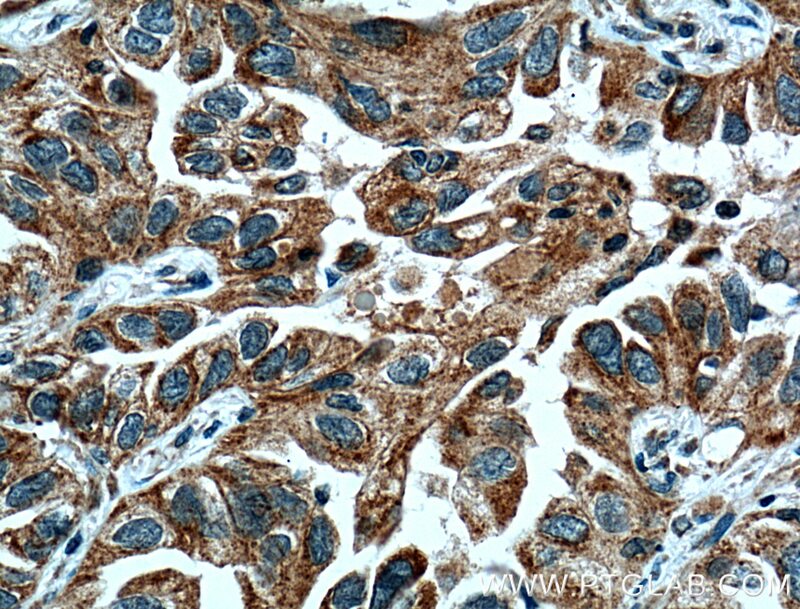 Immunohistochemical analysis of paraffin-embedded human breast cancer tissue slide using 12869-1-AP( UGCG Antibody) at dilution of 1:200 (under 10x lens). heat mediated antigen retrieved with Tris-EDTA buffer(pH9). 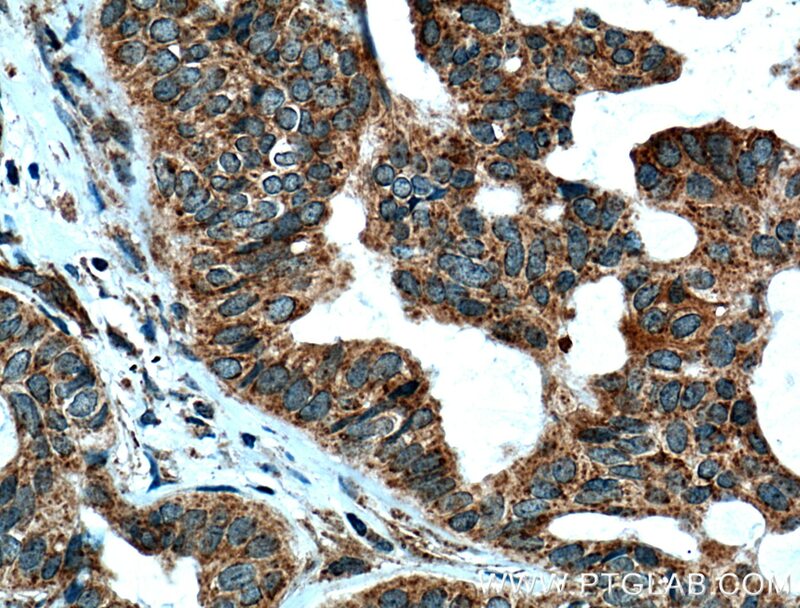 Immunohistochemical analysis of paraffin-embedded human breast cancer tissue slide using 12869-1-AP( UGCG Antibody) at dilution of 1:200 (under 40x lens). heat mediated antigen retrieved with Tris-EDTA buffer(pH9).